What would Negative Interest Rates Mean for America? Negative interest rates (NIRP) in Europe and Japan are a function of central banks out of control defending their country banking systems by cornering the market in so-called "risk-free" government bonds. The lack of lendable collateral in these economies at low rates is a function of poor fiscal policy (a.k.a. crony socialism), not a failure of the central banks since they are really only taking their cue from hopeless government leaders and entrenched, concentrated wealth pools, who own the banks. 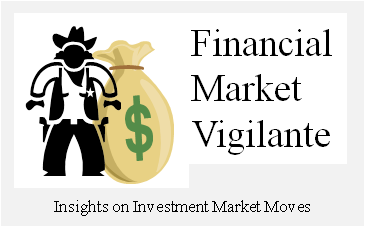 The utter failure of this scheme was predictable, and the repercussions on the country stock markets that have been affected are an appropriate market response. Likewise, both the EU and Japan currencies have suffered greatly in this race to the bottom. Fast forward to a world in which the major reserve currency in the world today, the U.S. dollar, is positioned through Fed policy to have a negative carry interest rate, to all the holders of dollars throughout the world. Chaos is the predictable outcome. It is the equivalent of both a default on the U.S. debt, and a tax on all foreign capital which is funding the U.S. debt. Cue up a major flight to hard assets, like gold, and anything else bolted to the ground, and a major run on the U.S. debt. This issue is far more critical to the potential economic outcome of such a decision than the effect on U.S. savers who are hopelessly tied to the policy decisions of their brain dead elected, and appointed in the case of the Fed, leaders. The problem is, the U.S. people alone do not have the $6.1T in funds needed to fill the gap left if the foreigners leave town. And if they do, they probably don't want to give $100 to the government to get $99 back, or even less, every year. If you want less of something, tax it. A NIRP direction in the U.S. is a stepping stone to an outright depression, not only in the U.S., but world-wide. The upcoming election is critical to making sure this path is not chosen by the U.S., assuming Obama doesn't make this his final nail in the coffin for the U.S. economy as he departs silently out of town. Can Cheap Oil Trigger a U.S. Recession? Historically, major drops in oil do not equate to causing a U.S. recession. However, cheap oil can tear down an over valued stock market, which is what is happening right now. For recent evidence, look at Black Monday in October 1987. Twenty-one (21) months after the Saudis started a similar oil pricing strategy as the market faces today, where the Saudis raise production to maintain market share, the U.S. stock market plummeted 40%. But there was no U.S. recession. Fast forward to 1998, oil prices plummet 55% over a two year period (1997-1998) as emerging markets faced a currency crisis. Russia defaulted; however, there was no U.S. recession. The stock market swooned in sympathy intra-year by over 20%, with the peak of the decline happening 20 months after oil prices began to crater. We are now at month 18 of the time frame in which oil prices started their decent starting in August of 2014. I estimate that $20-$25 per barrel in oil would force a similar emerging market crisis today, and trigger a similar U.S. stock flash crash as experienced in 1998. The oil futures curve over the past half year, dating from August 2015 to the end of January 2016, has undergone a radical downward move. In August 2015 the current March contract level was priced at over $48 per barrel. 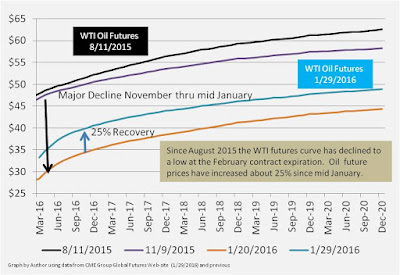 By mid January the contract dipped below $28 per barrel concurrent with the point in time the February contract expired. After expiration, the futures curve rallied over 25%, with the front month contract increasing to about $33 per barrel. The rally overall has been uniform across the entire contract spectrum, with mid-term longer dated contracts faring better.